Started the morning with a great family style breakfast at the Caratunk B & B and got out the door by 9 am. 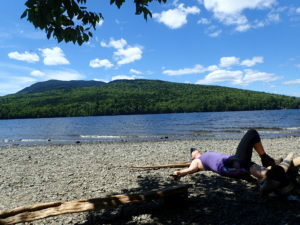 A little bit late for a start, but we had to wait for the ferry service to start for the day to get across the Kennebec. We reached the river to find a man waiting with a canoe to guide us across. I cannot remember his name, but he said he was a part timer and that he also is a raft guide for the nearby guide company. 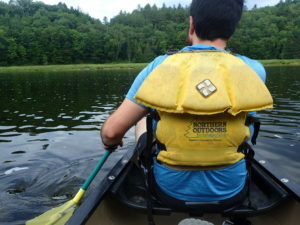 Soon we were in the canoe and made our way across the Kennebec. 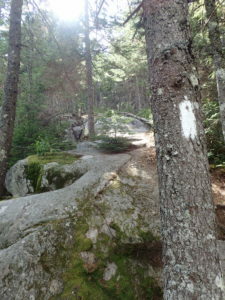 The trail for the day was a rugged chunder-fest, then almost like a sidewalk, then back to the roots and rocks Maine has so far been known for. 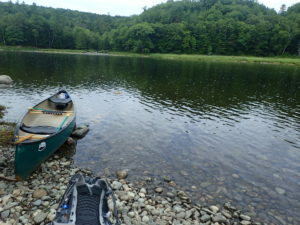 We found a really nice pond at our end point for the day, West Carry Pond. The pond begged us to jump in for a swim, and it was refreshing way to end a 14+ mile day. 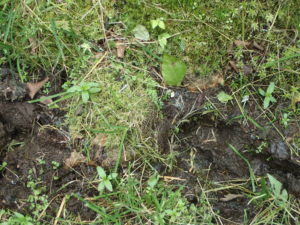 Almost forgot, we saw Moose tracks in the mud! The day started late again, we were the last ones to leave camp. We had to mild climbs and descents to start the day. Flagstaff Lake came into our view just in time for lunch. There was a really nice tent area, too bad we were only halfway through our day. The beach provided a great space for lunch and a quick rest. 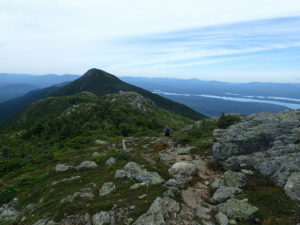 Finally we moved on to climb Little Bigelow and descend to Safford Notch Campsite. We arrived a little late and had to dig around to find a tent spot. Towards the back a family had set up and allowed us to snag the last flat space. Ate mac n cheese for dinner, then sleep. For the first time in a few days we were up and out of camp at a reasonable time. The family was still sawing logs when we quietly packed up and moved on. The stream at the campsite provided us with a nice source for water, we filled up and started our climb up to Avery Peak. It was a tough climb, but once we reached the top we were rewarded with great views. The descent from Avery was quick and so was the climb to the top of Bigelow. Next up, South Horn and the Horn Pond Lean-to. There was a large group at the Lean-to, so our visit was quick. Ate a snack and left a note for Tracker (hoping he would read it and catch back up with us). Our descent from the lean-to was steep and exhausting. We had originally planned to get to Stratton for the night, but decided to stop 2 miles away at the Cranberry Stream tent site. We did a quick 2 miles out of the trail to the highway and called for a shuttle from the Stratton Motel. Marching Band picked us up, gave us the drive by tour of town, the set us up with 2 bunks at the Motel. The day started with us empting our packs, tossing all of our dirty laundry into my pack and walking to the laundromat. The post office was next door to the laundromat, so once the washer was started we walked over to pick up our resupply box. Once that was in hand, back over to switch the laundry to the dryer. Will our clothes were drying, the resupply box was emptied and sorted. On our way back to the motel, we stopped at Fotters Market for sandwiches, pasta salad and freezer burritos. Ate the sandwiches and pasta salad outside the motel on a picnic bench, enjoying the cool breeze and sunshine. Grabbed a shower, organized our packs and got a game plan together to supplement our resupply. Out the door to walk to the gas station where we got some snacks, a local cider and a few resupply items. Then back to the motel to hang out and chat with some NOBOs. And, we were reunited with Tracker! We ate our burritos we bought earlier, and that’s when I realized the hiker hunger began for me. I had been constantly snacking all day! I weighed myself to find I have dropped 8 lbs! Next over to the Market for the last few resupply items and dinner. Dinner consisted of a tub of butterscotch pudding to start, followed by bbq chicken bites and a pizza. After a day of walking around and eating, it was time for bed. Up early to walk to the gas station to get breakfast sandwiches, a donut and coffee before our shuttle back to the trail. The day started with a 5 mile climb up Crocker Mountain. Overall, not a bad climb, just a long one. We ate lunch at the summit with 4 NOBOs. The decent sucked. We reached a tent site by the river, where I made the decision to call it quits for the day. Up early again, on the trail by 7. Started our day with a steep climb up Sugarloaf. Not as much of a boulder scramble as I was expexting, but then again I think my expectations are starting to change. Somehow I missed the plaque that commemorates the last section of the trail being completed (back in 1937). It also signified our 200 mile mark. We saw more Moose tracks in the mud! I am starting to notice a lot more Northbounders now. We passed a ton of them. And last random note for the day… Red Bird had a staring contest with a Red Squirrel. I’ll be happy to get out of Maine (or where ever) and leave the damn Red Squirrels behind us! The ending point for the day was Poplar Rdge Lean-to where a descent sized group had beat us there and had taken up most of the area. We had to walk back up the trail to find a spot big enough for our tent. Up early again, and once again, on the trail at 7. Finally starting to get into a good routine. Our day started with climbing up to Saddleback Junior. Followed by a really steep and crappy descent. Filled up with water before heading back up. We reached the summit of the Horn after a series of boulder scrambles. 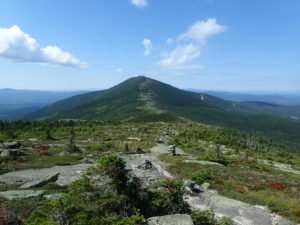 Once we reached the summit we had a wonderful view of Saddleback, and realized the next descent and ascent would be mainly be above treeline. Something we really hadn’t experienced since we startted. We enjoyed our lunch laying out in the sun on the rocks. The up and over Saddleback we quickly and we soon found ourselves at the trailhead waiting for our shuttle to Rangely, ME.